Clearly, the British were big on documenting the activity of their empire. Felice Beato travelled extensively in the late 1800s and documented interesting events. According to Mridula Chari for Scroll.in, this unusual though perhaps Orientalist collection of images by the photographer, a native of Corfu, gives us fresh insight into one of the most turbulent periods in Indian history. The first corpses to be photographed might have been Indian. In the 19th century, images of Indians slain in the closing moments of the war of 1857 taken by Felice Beato, a citizen of the British protectorate of Corfu, were sold en masse in the United Kingdom as prints and postcards. His gritty images, not just of the conflict in India but also of the Crimean War that had preceded it, earned him the reputation for being one of the world’s first war photographers. As can be imagined, Beato didn’t have it easy. Photography in 1857 was a laborious process. This was a time when photographers were limited by the long exposure times required for the plates of the camera to record light and were unable to capture movement. Yet Beato was an incurable traveller, invariably drawn to the heat of battle. 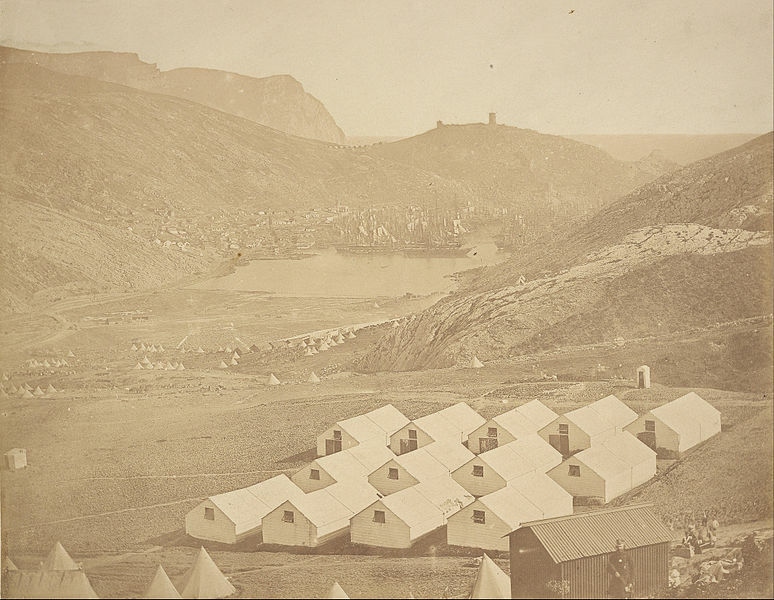 On his first travelling project in 1855, he captured images of the Crimean War. The end of Balaclava Harbour, 1855-1856. Photo at the J Paul Getty Museum. Three years later, shortly after the British violently suppressed the Revolt of 1857, Beato docked in Calcutta. It had been only a few months since the violence had died down, and as Beato travelled from Bengal to Delhi, he found a number of subjects that caught his eye. 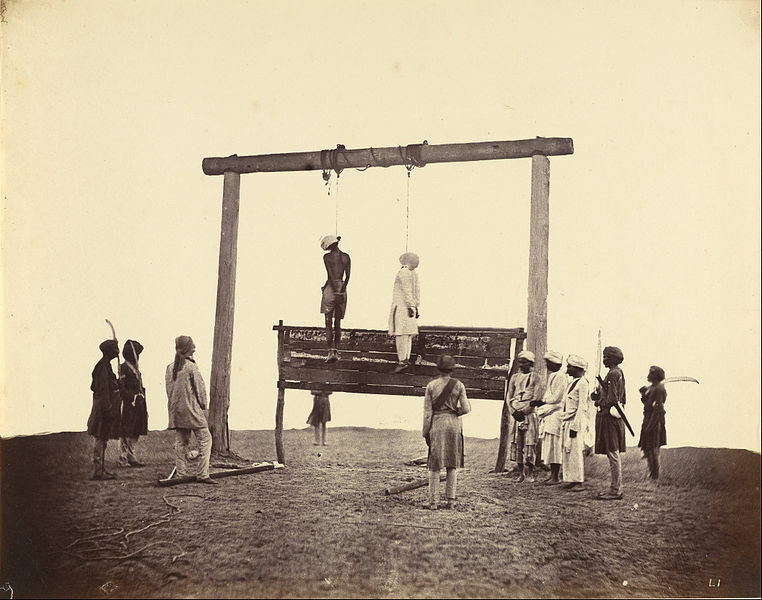 Two sepoys of the 31st Native Infantry, who were hanged at Lucknow, 1857. Photo at the J Paul Getty Museum. Accompanied by a full caravan of Indian workers helping him set up the camera and travel comfortably, Beato travelled through the north of the country in search of sites to photograph. It is believed, though not established , that he was the first person to photograph corpses. In Sikandar Bagh in Lucknow, he had bodies of slain Indian rebels dug up to define his pictures better. Another of his images from Delhi shows an entire road strewn with disembodied skulls. 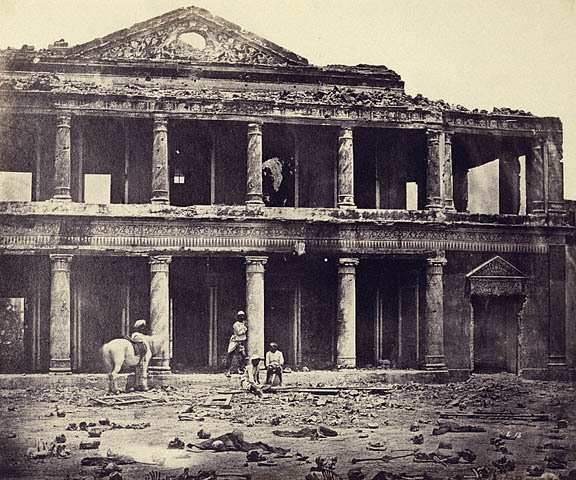 Interior of the Sikandar Bagh after the slaughter of 2,000 rebels by the 93rd Highlanders and 4th Punjab Regiment, April 1858. Photo at the J Paul Getty Museum. Photo at the Brown University Library. India was only one of the first of Beato’s destinations. He then sailed to China, just in time for the second Opium War, and on to Japan, where he seems, finally, to have put aside his predilection for capturing violence. Beato was such a traveller that historians and photography enthusiasts today regularly follow his trail and attempt to recreate the photographs in contemporary settings. A group of videographers even attempted to pin down the exact locations of a set of images he’d shot in Crimea. One of these is Jim Masselos, an Australian professor who came across a collection of Beato’s Delhi photographs at a secondhand book sale in Sydney in the mid 1990s. 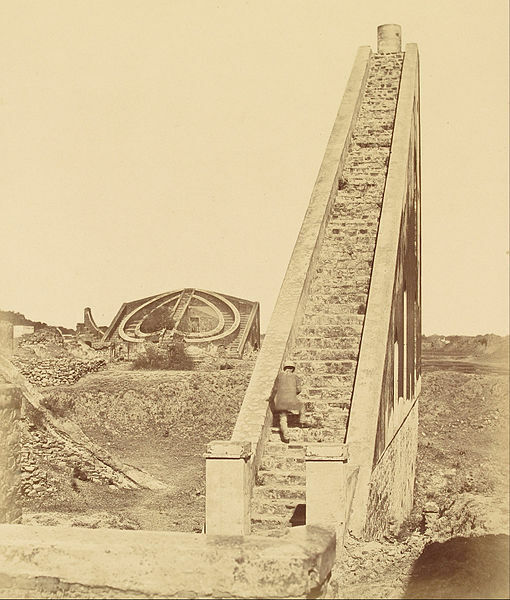 Jantar Mantar near Delhi, 1858. Photo at the J Paul Getty Museum. However, Masselos was not content with simply possessing the images. He wanted them to be in the public domain. He approached historian Narayani Gupta, who suggested he put them in a book. They also thought it would be a good idea for Masselos to travel to Delhi and recreate photographs of Beato’s works in the exact same location, if only to show how much Delhi had changed since 1857. In 1997, assisted by two researchers, Masselos stalked the streets of Delhi in search of elusive fragments or road structures that might have survived intact since Beato’s time. Entrance to the Jama Masjid in Delhi, 1858. Photo at the J Paul Getty Museum. Masselos teased out the patterns in Beato’s images. In several, for example, there is one tall Indian with his turban hanging halfway down his back. He wears nothing except a dhoti. Yet Masselos is also careful to point out that many of Beato’s photographs are decidedly Orientalist, minimising local populations while highlighting landscapes and architecture. A more charitable interpretation would say that Beato was only following the established conventions of landscape photography, which did not prioritise people. 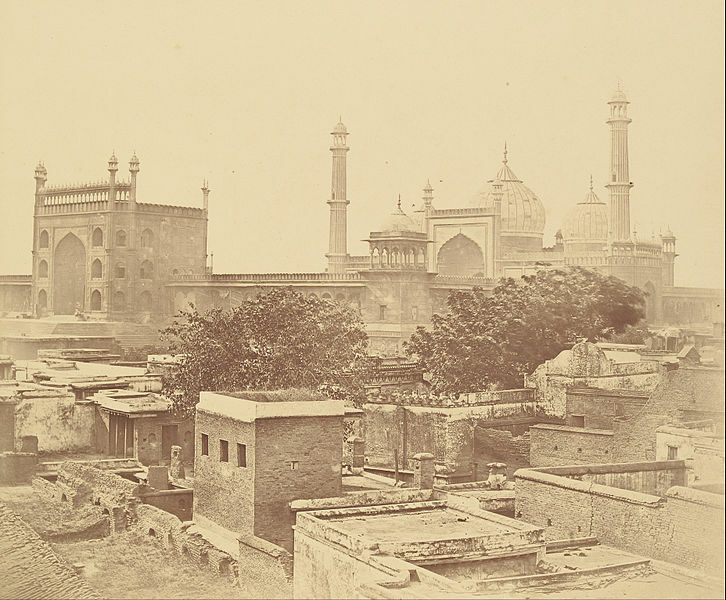 Masselos’s photos came together in an illustrated book titled Beato’s Delhi: 1857 and Beyond, co-authored with Gupta. In their essay, they note that Beato was at heart a commercial photographer. Since he took images on plates and not on one-time photo sheets, he was able to mass produce his photographs to suit his audience.